Following the secession of several southern states from the Union, the American Civil War formally began on April 12, 1861, when Confederate shore batteries under General Pierre G.T. 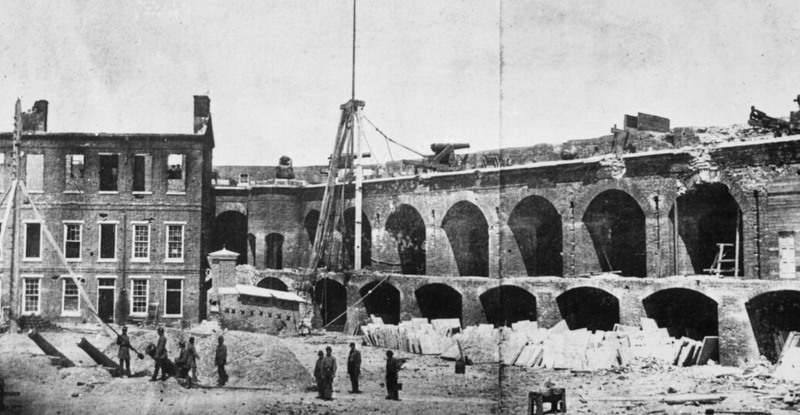 Beauregard opened fire on Union-held Fort Sumter in South Carolina’s Charleston Bay. Two days later, U.S. President Abraham Lincoln issued a proclamation calling for 75,000 militia to help quell the “insurrection.” Four years later, the Confederacy was defeated at the total cost of 620,000 Union and Confederate dead. Confederate soldiers stand beneath the Confederate Flag shortly after the Union surrendered Fort Sumter in April 1861.